The sound of beeping life support and a man lying still in a bed is what greets audiences as they enter Morris Hall to take in TNC’s production of The Diving Bell and the Butterfly. The ominous scene poignantly sets the tone for the emotionally intense play that is to follow. 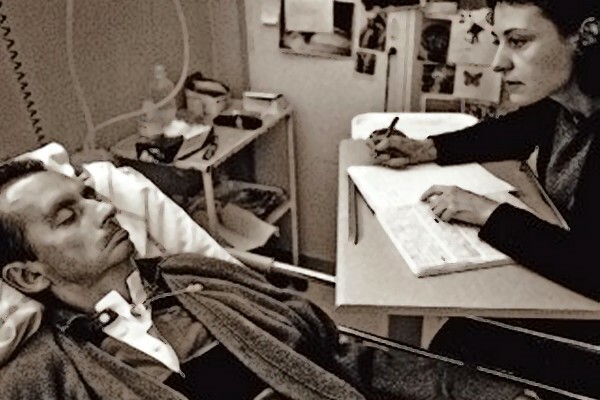 The Diving Bell and the Butterfly tells the real-life story of Jean-Dominique Bauby, Editor-in-Chief of French Elle magazine. JD was paralyzed from head to toe after a stroke, left able to only blink with his left eye. The stage adaptation depicts Bauby’s diagnosis and the difficulty he has with accepting his condition at first. It continues on Bauby’s journey as he slowly learns to speak in a new way, and finally it shows how his creativity flourishes, which ultimately led to the writing of his memoir. The play beautifully sheds light on the tragedy and resiliency of the human spirit and brings to life the emotion felt by a “wounded” man. With each scene as emotionally charged as the next, audiences are able to truly connect with Bauby and get a feel for the tragedy of his condition. The adaptation switches things up by having two actors (Chris Naccache and Gabe Meacher) portraying Jean-Dominique. One plays “the diving bell”, the paralyzed and blinking body lying on the bed, while the other serves as the narrator and portrays “the butterfly”, the fully functioning mind. The two actors switch back and forth between portraying the diving bell and the butterfly from one scene to the next, emphasizing the fact that Jean-Dominique is comprised of both his body and his mind. Both actors are able to showcase their tremendous skill, as their performance is comparable to sophisticated film acting rather than student theater. The casting of two actors for the role of Jean-Dominique was a creative decision that made artistic sense and contributed to the success of the show. Other casting choices, however, were not as self-evident. The casting of Ella Storey as both Jean-Dominique’s doctor and his good friend Laurence can be confusing, as it is easy to mistake one for the other at first. The change in acting style that Storey takes on for Laurence is very distinct, but some audience members may not immediately catch the change in character. Rather than having an overly animated and expressive portrayal of Jean-Dominique’s conscious mind – the butterfly – the character is instead rather quiet and still, keeping his emotions confined and only demonstrating them in his expressions and dialogue. This artistic decision speaks even more to the show’s meditation on what a mind alone is capable of. The decision to have the two versions of Jean-Dominique placed rather far apart from each other on set made it difficult to see both actors at the same time depending on your location in the audience. While this can be frustrating to some, it may have been an intentional artistic decision to further demonstrate the split of Jean-Dominique’s character. The set design and costume choices, as well as the use of technology, all worked superbly together, and while it may sound pessimistic to say that a good set is one that nobody notices, it rings true for this production in the best way possible. The set and the costumes perfectly allow the audience to be transported into Bauby’s world without being distracted from the actual acting that is happening. Including music in two key scenes of the show was a bold choice, but one that paid off. The music gave a new energy to the chapter of the story in which Jean-Dominique seems to be accepting his condition. Here, the music conveys the uplifting message that life has so much to offer, even to someone who is “trapped” in an unfortunate situation.TNC’s production takes the sadness of this story, touches on the difficulties of optimism, and casts aside any temptations to be despairing, indulgent, or exaggerated in its exploration of the story’s complicated emotional web. The somber mood resulting from Jean-Dominique’s diagnosis persists throughout the production, but in no way overshadows his triumphs of learning to live again, portrayed by the sad smiles of the butterfly. While this story doesn’t have a happy ending since the tragedy of Jean-Dominique’s immobility will persist, TNC nonetheless perfectly conveys the uplifting and hopeful truth that life can and does go on on in a flawed yet beautiful way. TNC’s production takes the sadness of this story, touches on the difficulties of optimism, and casts aside any temptations to be despairing, indulgent, or exaggerated in its exploration of the story’s complicated, emotional web. The somber mood resulting from Jean-Dominique’s diagnosis persists throughout the production, but in no way overshadows his triumphs of learning to live again, portrayed by the sad smiles of the butterfly. While this story doesn’t have a happy ending, TNC nonetheless perfectly conveys the uplifting and hopeful truth that life can – and does – go on in a flawed, yet beautiful way. TNC’s The Diving Bell and the Butterfly runs from Feb. 10–13 at 8:00 p.m. in Morris Hall (3485 Rue McTavish). Tickets are $10 for adults, and $6 for students and seniors.